Seniors lag behind the rest of the population in using the Internet and social media, but there are many benefits of going online. Robert Boyd of San Francisco didn’t know much about the Internet when a tourist from Australia approached him several years ago and asked if she could post his photo on her Facebook account. Curious about Facebook and the Internet, he soon started visiting San Francisco’s Community Technology Network (CTN) at the Downtown Senior Center. After he learned the basics, the fashion enthusiast started posting daily photos of himself on Facebook and Twitter. He now hosts a talk show on YouTube and makes guest appearances on other fashion programs. Like many other seniors, Boyd is discovering how to connect to a larger world than the one he knows in his neighborhood. The CTN serves 25 senior centers throughout San Francisco, where visitors use computers to watch videos, answer email, research medical information, hear music and keep up with their friends on Facebook. It’s part of a larger movement to get older adults online. Though seniors have been slow to take advantage of the Internet, and social media in particular, the numbers are increasing. In 2014, the Pew Research Center reported that 59 percent of those 65 and up said they go online, a 6 percentage point increase from the previous year. Forty-seven percent said they had a high-speed broadband connection at home, and 77 percent have a cell phone, up from 69 percent in April 2012. Despite these gains, many seniors don’t participate in the online world. Forty-one percent do not use the Internet at all, 53 percent do not have broadband access at home and 23 percent don’t use cell phones. The figures are worse for older adults 75-79, with only 47 percent using the Internet and 34 percent having a broadband connection. Yet, being part of the technological world has many benefits for seniors. A Stanford study found that “using tech to connect with loved ones was related to higher life satisfaction, lower loneliness and general attainment of meaningful goals—being happy, independent,” said researcher Tamara Sims of the Stanford Center on Longevity (quoted in Silicon Valley). The research team surveyed 445 people between the ages of 80 and 93, asking the reasons for using cell phones, personal computers, video streaming services and other digital tools. 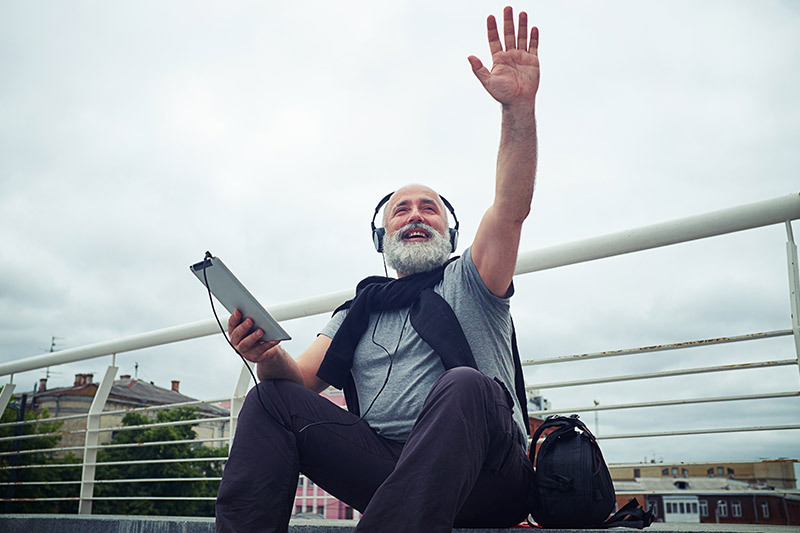 Despite the Pew figures, most of the adults over 80 said they used at least one technological device regularly, which they said improved their physical and mental well-being. Research is increasingly showing that staying socially engaged keeps people healthy. For older adults, social engagement can be more difficult after retirement when we no longer have our main social structure. As we age, we lose spouses and friends, and bad weather or physical problems can keep us inside, reinforcing the isolation. Surveys show that one-quarter of seniors live alone. That’s why technology can be valuable. With video chat services like Skype or FaceTime, you don’t have to leave your home to have a face-to-face conversation with a friend or family member. On Facebook, you can find old friends and make new ones through mutual interests—whether it’s the Civil War, genealogy or Charles Dickens’ novels. On Facebook or Flickr, your friends or family can share photos of their vacation on a daily basis, so you almost feel as if you are traveling with them. On Facebook or YouTube, you can watch videos of your grandson enjoying his birthday and laugh while he stuffs his mouth with cake. Sitting at your desk at home, you can use your computer or Nintendo Wii to play various games, either by yourself or with others. On Twitter, you can follow your favorite politician or movie star and create conversations with others. In its survey, the Pew Center found that a significant majority of older adults said they need assistance when it comes to using new digital devices. Among seniors who go online but don’t use social networking sites such as Facebook or Twitter, 56 percent said they would need assistance if they wanted to use these sites to connect with friends or family members. Fortunately, there are a lot of resources. Senior centers, libraries, schools and community centers offer beginning courses on using different media. And don’t be afraid to ask your grandchild or younger neighbor for some help. Eldercare Locator’s “Staying Connected: Technology Options for Older Adults” guide offers basic information about Facebook, email, texting, YouTube, Twitter, Skype and other technological tools. Many senior living facilities also offer classes as well as computer rooms, where you can ask the person sitting next to you how the heck you send a message on Facebook. “Elders who use tech tools feel less lonely, more physically fit, Stanford study finds,” Nov. 29, 2016, Silicon Valley. “5 Benefits of Technology to Share with Seniors and Their Caregivers” Caregiver Stress. “5 Benefits of Social Media for Seniors – Let’s Help Them Get Online,” Senior Care Corner. “Older Adults and Technology Use,” April 3, 2014, Pew Research Center. “5 Ways Technology Can Benefit Your Grandparents,” Huffington Post. “Computer Skills Give Senior Fashion Icon Whole New Audience,” Jan. 24, 2017 SF Connected.